By the time you reach week 12, your little one is growing faster than ever – and you’re probably starting to feel a bit hungrier. While you definitely deserve some goodies, it’s important to treat yourself and your baby to the best possible nutrition. 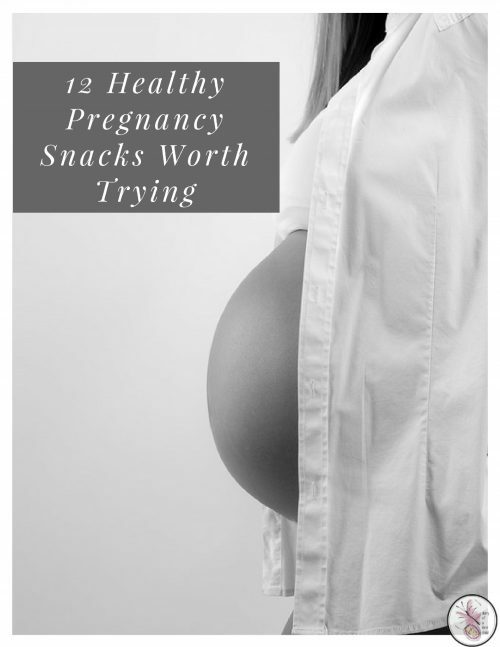 With this in mind, here are a dozen ideas for healthy, easy pregnancy snacks. Fruit and yogurt: Pick your favorite fresh fruits and top them with calcium-rich yogurt – preferably the unsweetened kind. Berries, bananas, and melon are perfect. If you’re feeling extra-hungry, try topping your yogurt with a little handful of nuts or granola. Smoothie: Make your own with greens, fruits, and nut milk, or choose a tasty, easy-to-digest option like Vega. Veggies and dip: We’re not talking about boring old salad dressing here: Choose a natural, healthy dip like hummus or mild guacamole. Both make veggies more exciting, and both pack plenty of nutritional wallop. Homemade Popsicles: If you’re suffering from morning sickness and can’t keep much down, popsicles will help keep you hydrated while tempting your taste buds. They’re easy to make: Just fill a cute popsicle mold with your favorite juice and enjoy once it’s completely frozen. Popcorn: High in fiber, low in fat, and big on taste, air-popped popcorn makes a fantastic snack during pregnancy or anytime. Pop a big batch in advance, season it, and carry pre-portioned bags along so you’ll never go hungry. DIY Trail Mix: Pre-made trail mix can be disappointing. Make your own, complete with your favorite nuts, dried fruits, and maybe a bit of chocolate, and enjoy an easy, portable snack anytime you’re feeling a bit peckish. Apples and Nut Butter: Fiber, protein, and a little bit of fat combine with tempting flavors, making this a very satisfying snack. Peanut butter is a traditional choice; if its odor bothers you now, try something milder, like cashew or almond butter. Pears and Cheese: A ripe pear and your favorite cheese make a delicious, nutritious snack. Slice the pear into bite-sized wedges for drip-free enjoyment. Chocolate: Paired with your favorite fruit or a few nuts, or even blended into pudding or a smoothie, chocolate can improve your mood. It might even reduce your risk of preeclampsia, so indulge a little if you like! Banana Toast: Bananas, nut butter, and toast make a filling, comforting snack. For a portable version, simply spread your nut butter and banana slices on a whole-grain wrap, roll it up, and take it along. Edamame: Indulge your salt cravings with something a little healthier than chips or crackers. Edamame offer plenty of protein, plus they’re a great source of fiber. Natural Energy Bars: Portable, quick, and available in a variety of fantastic flavors, energy bars can keep you going even when you have no time to fix a healthy snack. Look for brands with no high-fructose corn syrup – it’s just a source of empty calories. KIND, Larabar, and Luna are three good ones to try.